Rick Snyder, the recently elected governor of Michigan came to office with several other Tea Party young Turks, the horde of Vandals and Visigoths who stormed various, mostly mid-western governments in order to sack them, with the ultimate goal of driving out civilization in favor of corporate plunder. Knocking holes in budgets with tax giveaways to corporations, and then filling them up by taking the difference out of the hides of workers and the middle-class has been the new crusade. Now Snyder is being sued by Detroit workers’ pension fund, asking a court to rule the new Emergency Manager law unconstitutional. This would be the law moved through the Michigan legislature and signed by Mr. Snyder allowing the governor of the state to intervene in the budgets of cities and localities, determining them to be in a state of emergency, and authorizing the governor to appoint an “emergency manager.” This Emergency Manager is answerable only to the state’s governor, and supersedes the authority of local elected officials, essentially replacing them. If this sounds like something out of the Eastern Bloc circa the Cold War, welcome to the Republican Party since it became the Tea Party (Code for ultra right-wing). This is another way of skinning the cat Scott Walker the governor of Wisconsin managed: gutting workers’ pay and putting unions out of business as much as possible. The Emergency Manager, the governor-appointed autocrat newly in charge of cities and towns of course would have the power to terminate contracts and to suspend union agreements. Yes, I know what you’re thinking: wages for ordinary workers in this country are just way, way too high; and the middle-class has had it way, way too easy, for way way too long. At least that’s the situation according to the standard Republican view. So the prescribed cure of course is to dampen, well, drown the only remaining source of upward pressure on wages, which is unions. You perhaps are surprised that Republicans, governor and legislators would engage in such crude and brutish big-footing of cities and towns, given their long rhetorical record of denouncing federal big-footing of states, alternating with soaring, tear-wrangling paeans to local sovereignty. In fact, in Republican Land, at least on the basis of their public oratory, not only are small, and especially rural towns the repository of all that is good and holy, they’re the real America. In fact, if you live in a major metropolitan area I hate to tell you this: but I’m afraid you’re out. Yet apparently, in the opinion of Snyder and his Republican friends in the legislature these locals just can’t be trusted to negotiate with their own teachers or allowed to pay their workers what they consider a fair wage without a governor storming in and showing them the way, in this case nullifying their actions, and for all intents and purposes eliminating local governance. Of course, even in foreign policy conservative objection to authoritarian regimes was always specious. A firm hand always struck them as necessary and welcome. It just depends on the ideological bent of the given authoritarian. Right-wing dictators or regimes, such as Somoza’s in Nicaragua or Pinochet’s in Chile were just what the doctors, or better, the generals ordered. The leftist versions, say Cuba for instance: are very, very bad. The former provide “stability”. The latter looms as a “dangerous threat to democracy.” So let’s give Rick Snyder three cheers for bringing stability to the cities and towns of Michigan. 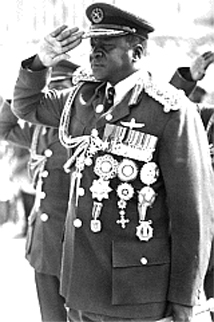 Though the accompanying photo here is of General Idi Amin, the classic former strongman who ruled Uganda, Snyder’s action comports much more closely to that of former president of Russia Vladimir Putin, who, uncomfortable with the results of local elections and local officials came up with the “innovation” of terminating the election of regional governors and replacing them with governors appointed by the Russian president. At least, unlike Snyder he didn’t come up with the pitiful excuse that he had to do it to save the Russian budget. Closer to home though, Scott Walker and Rick Snyder appear to be the new Republican model: all-powerful surrogates for corporations and wealth, and proudly serving the one or two percent of their state’s citizens fortunate enough to fall into either category.